Indication Ophthalmic solution used for the reduction of elevated intraocular pressure in patients with open-angle glaucoma or ocular hypertension who are intolerant of other intraocular pressure lowering medications or insufficiently responsive (failed to achieve target IOP determined after multiple measurements over time) to another intraocular pressure lowering medication. Pharmacology Travoprost, an isopropyl ester prodrug, is a synthetic prostaglandin F2 alpha analogue that is rapidly hydrolyzed by esterases in the cornea to its biologically active free acid. The travoporst free acid is potent and highly selective for the FP prostanoid receptor. Toxicity Symptoms of overexposure include irritation to the skin, eyes, nose, throat, and respiratory tract. Biotransformation Travoprost, an isopropyl ester prodrug, is hydrolyzed by esterases in the cornea to its biologically active free acid. 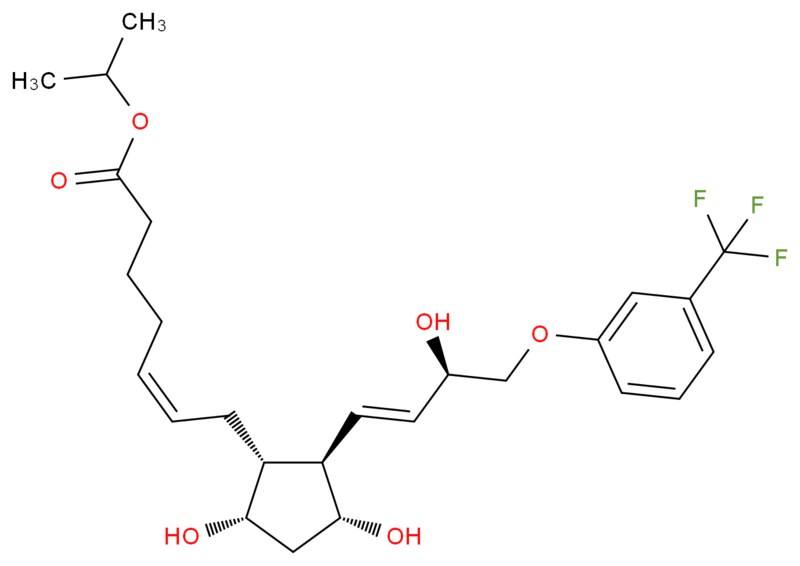 Systemically, travoprost free acid is metabolized to inactive metabolites via beta-oxidation of the α(carboxylic acid) chain to give the 1,2-dinor and 1,2,3,4-tetranor analogs, via oxidation of the 15-hydroxyl moiety, as well as via reduction of the 13,14 double bond. Absorption Systemically absorbed when administered to the eye. Half Life Terminal elimination half-life of travoprost free acid is 45 minutes. Elimination Less than 2% of the topical ocular dose of travoprost was excreted in the urine within 4 hours as the travoprost free acid. Selective FP prostaglandin receptor agonist. Isopropyl ester of (+)-fluprostenol. Antiglaucoma.